D-Pol promotes increased vascularity and with long-term use, can increase strength, stamina, and performance. An increase in libido can also be seen while taking D-Pol, an added benefit to D-aspartic acid, the main ingredient. If you are looking for a great D-aspartic acid supplement, D-Pol is the product for you! 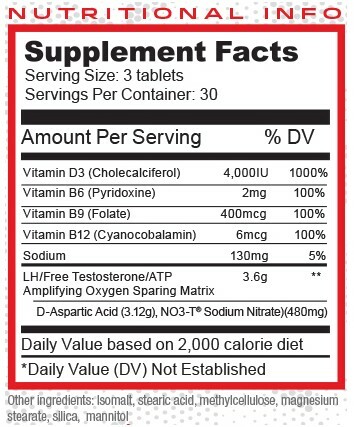 D-pol is intended only for healthy adults above the age of 18. Do not use if you are currently pregnant or nursing, could be pregnant, or are attempting to become pregnant. All individuals should consult a licensed healthcare practitioner before using this product. Do not use this product if you have been diagnosed with or have a family history of (including, but not limited to): heart disease, thyroid disease, liver disease, cancer, Barrett's Esophagus, gastroesophageal reflux, diabetes, hypoglycemia, hypo/hypertension, asthma, any psychiatric condition including depression or seizure disorder, or if you are using any other dietary supplement, prescription drug, or over-the-counter drug intended to promote vasodilation, in particular, those intended for erectile dysfunction. The combined use of vasodilatory supplements or drugs and D-pol could cause an unsafe drop in blood pressure. Discontinue use and contact a medical doctor immediately if you experience an irregular or rapid heartbeat, chest pain, shortness of breath, dizziness, lightheadedness, fainting or presyncope, tremors, headache, nausea, or other similar symptoms.